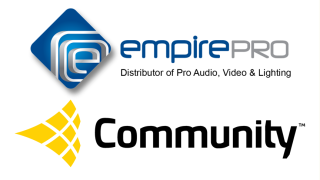 Empire Pro, nationwide distributors of professional audio, video, and lighting equipment, is now an authorized distributor of Community Professional Loudspeakers. Community is an American company whose products have shaped the professional sound industry since 1968. Community is well known for high-performance outdoor loudspeakers such as its R SERIES family and continues to innovate with products like ENTASYS three-way column line array.